“Bernera is a tiny tidal isle to the north of the larger island of Lismore, near Oban, Argyll, Scotland. In the latter 6th century a.d. it was settled by monks of the Irish Culdee church under the leadership of St. Moluag (Lugaid in Irish Gaelic). 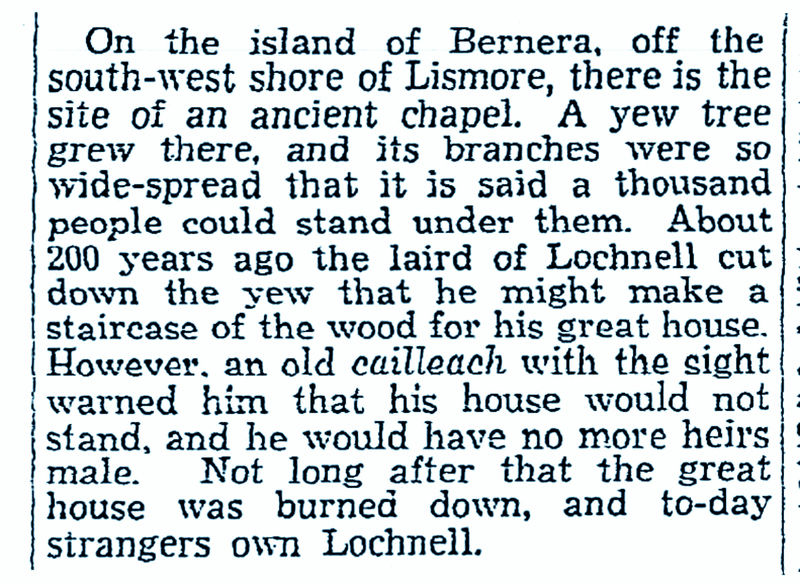 The famous Scots historian Nigel Tranter records on p. 236 of Columba (1987) that the island was given by St. Moluag to St. Columba for a spiritual deseart (Gaelic)- usually a private place for occasional retreat, meditation and prayer. This fact is celebrated in the church of Lismore where St. Columba is depicted with the great yew in a stained glass window. As recorded in the annals of the Livingstone clan there are the remains of “a small oratory and an oblation cairn….close by to where the yew tree stood”. An old poem in the same source mentions “Bearnarey (sic) of the noble yew”. 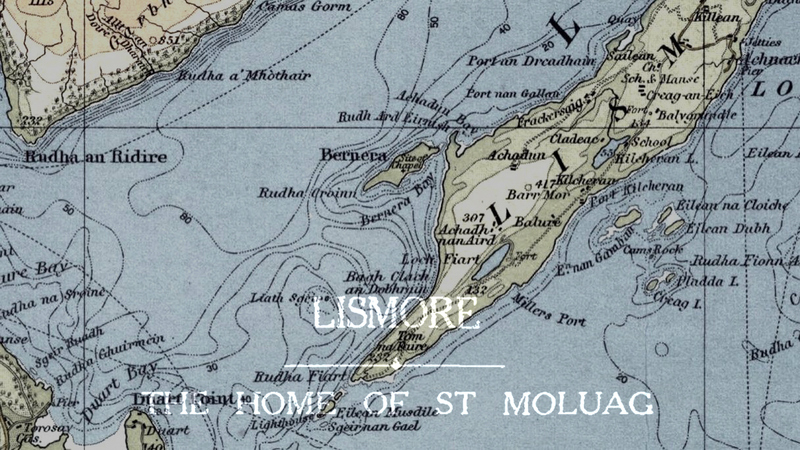 Records also state that the people of Mull and Morvern, as well as those of Lismore, came to where St.Columba was “wont to preach”’ under a large yew tree which “stood on the edge of the island, half of it over the land and half over the sea”. 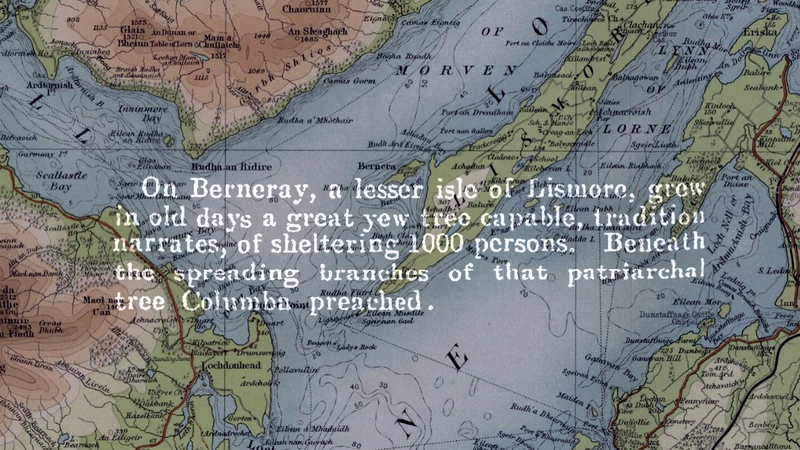 In size it is said to have been capable of sheltering “a thousand people beneath its widely spreading branches”. The Livingstone annals additionally state that Columba prophesied the noble tree would fall to the “pride and greed of man” and that the “guiltiness of the act would only be expiated by water and blood and three fires”. Robert Hutchison FRSA in his “On the Old and Remarkable Yew Trees in Scotland’ (Transactions of the Royal Scottish Arboricultural Society 1890) notes that this yew “of vast size”’ was felled “prior to 1770’ by Sir Duncan Campbell of Lochnell”. The Livingstone’s history notes that one man was killed by the falling tree “dyeing the rocks red with blood” and before a Highland six oared boat fully laden with the cargo of yew reached the mainland, a sudden storm caused its sinking and several men were drowned. 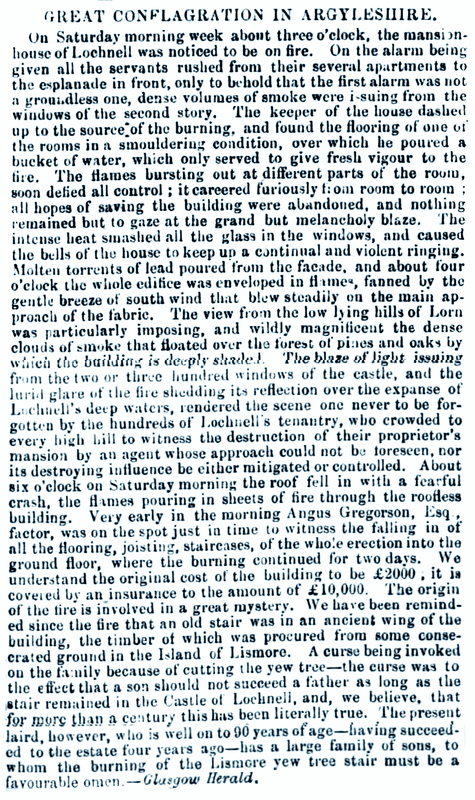 Despite these tragedies the yew wood was retrieved and turned into a staircase in the new mansion house built for the Campbells at Ardmenhuis – Lochnell Castle – and history definitely records at least two fires, some sources claim three, which have burned down the building, but the staircase has still survived. It certainly seems rational to give consideration that the prophecy, noted centuries before the yew was felled, may have indeed come to pass by blood, water and three fires. 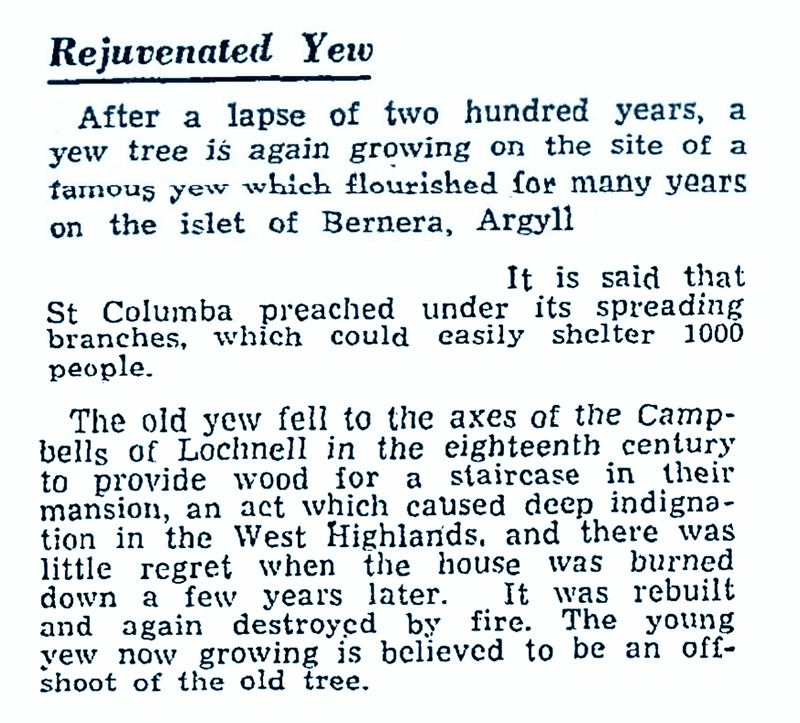 Around 50 years ago it was noted that St Columbas Yew was miraculously springing back to life. A visit by Professor David Bellamy and other yew experts in 1994 confirmed that this was the case. In recent years the Campbell family, under the auspices of the Earl of Dundonnel, have taken cuttings from the yew and planted them on the mainland. It is said to be a simple act of of atonement in acknowledgement of the grievous misdeed in the past and, however, a very serious attempt to lift a “curse”’ which has dogged the family ever since they felled the sacred tree so dear to St. Columba (source – private correspondence). The implications of the survival of St. Columba’s yew are also staggering not merely by reason of historical association with such a sacred figure (dubbed the “Celtic Christ”’ by St. Augustine himself) but also on a biological basis. 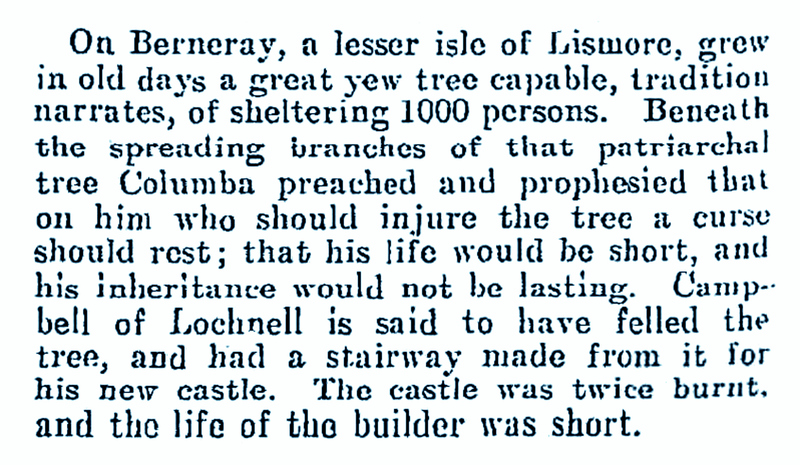 Certainly the size of the tree in the 18th century being emphasised in italics as “vast”’ by a person knowledgeable about great yews such as Robert Hutchison gives credence to it truly being massive over a thousand years earlier in Columba’s day – and the descriptions that it could shelter one thousand people in the late 6th and early 7th century may not be that apochryphal nor exaggerated after all. Indeed the investigation of 1994 seemed more to confirm the possibility than deny it. The amount of timber the tree yielded as recorded, and its subsequent resistance to fire on more than one occasion, implies tight grained and slow-grown wood, also supporting that the tree may well have been more than one thousand years old when Columba first saw it. This means that this yew, once of vast size, may additionally be of vast age, as it is clear that it is certainly, at the very, very least, 1500 years old already. Therefore this tree should deservedly be regarded as one of the most essential members of Britain¹s ancient tree heritage – as its veteran status, historical and spiritual significance is already without question.